This weekend, I flew down to the Kennesaw Mountain Writing Project site to take part in a series of exciting discussions about the work being done by various groups (such as the Western Massachusetts Writing Project) that are considered Technology Seed Sites. This means that we are pioneering some use of technology for professional development for our network of teachers. The NWP brought us all together to share the successes and challenges that we are facing in our work. 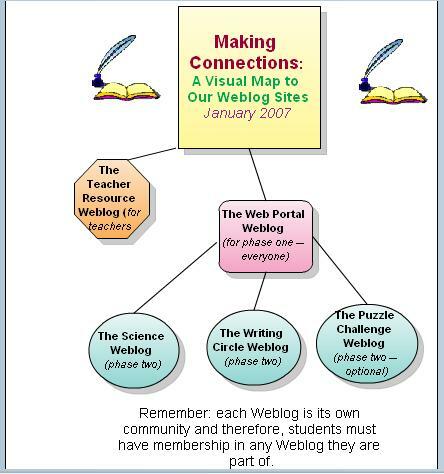 I talked about our Making Connections weblog project that is designed to reach out to urban and rural communities and help forge relationships with teachers in those districts, provide support for technology implementation, and get kids from very different communities “talking” to each other via weblogs. We are just about to entire Year Two of the project. You can view the report from Year One here. Third Coast Writing Project (in Michigan) has been conducting mini-institutes around the concept of digital storytelling (which seemed to be a common strand among some of the 8 Seed Sites). They have created a cadre of workshop presenters and a task force to think through technology. The Maine Writing Project has been moving away from the term Digital Storytelling and into the realm of Writing in Modern Media, which reflects a general shift towards reflection on how we are re-casting composition in our classrooms. The Prairie Lands Writing Project (in Missouri) has been focusing in on technology institutes for its teachers as well as professional learning communities where thoughtful educators come together to brainstorm the integration of technology with writing. The Oregon Writing Project has created a vibrant state network of technology leaders, with hopes of filtering knowledge down to the individual sites. There are many challenges to using technology in the schools (access, equity, etc) but the work is exciting. Much work focuses on three areas: Writing with technology (genres, rhetorical context, etc); Teaching with technology; and professional development. There is very little research out there to help provide the framework for what we are doing — we are in “uncharted territory,” as they put it. Teacher-leaders involved in these ventures are becoming “hybrids” in that they are forging a connection between the disciplines, writing and technology in new ways. Yesterday, I took part in the Western Massachusetts Writing Project‘s Best Practices in the Teaching of Writing. This is our annual event to showcase some of the inspirational work going on in our classrooms through workshops and roundtable discussions. I led a workshop called Blogging for Beginners, and the teachers who worked with me created their own blogs through either WordPress or Edublogs this morning. Instead of a traditional written reflection, we opted to record their voices as they discussed how they envision using blogs for personal, professional and/or educational uses and post it as an audiocast. (That move was inspired by Paul Allison’s efforts on his site called Teachers Teaching Teachers — thanks again, Paul, for providing a framework and inspiration). We also had the pleasure of a wonderful keynote speaker, Anika Nailah, who discussed passionately how fiction writing can bridge cultural divides and allow people from different backgrounds to “come into the same room” as others. Anika also had the audience doing some writing and examining our own cultural backgrounds with language. She also allowed me to record her speech (I am the technology liaison for the WMWP) and audiocast her talk for members of our network who could not attend. One of the more exciting ventures that I oversaw last year as a leader with the Western Massachusetts Writing Project was a new partnership with our area’s largest newspaper, The Springfield Republican. Inspired by a similar effort at the Vermont Writing Project, the monthly publication seeks to highlight teachers in our WMWP network and the writing that is being done by their students. Among other things, this newspaper connection helps with continuity of the site by keeping our network connected. It also helps get the word out about the National Writing Project. You can view PDF versions of some of the features at the newspaper’s online site.